The division of the Korean peninsula separated many families in the North and South for decades with few families having had the opportunity to reunite with their loved ones. Ki Man Kim and Ki Chang Kim experienced that sad fate; they were brothers that remained separated all their adult lives with the exception of one brief reunion. Ki Man Kim (1924-2004) spent his life as an artist in the North and rose to fame as one of the best painters in North Korea. He painted hundreds of pieces, including landscapes, small animals and flowers, some of which the North considers national treasures. Remarkably, his brother, Ki Chang Kim (1914-2001) became a renowned modern ink painter in the South. His early works were traditional ink paintings while his later works were more abstract. Korea, and Mt. Baekdu and Mt. Kumgang. After decades of separation, Ki Chang Kim was aging and ill when he had a short reunion with his younger brother in 2000. As Ki Chang Kim laid on a hospital bed without the ability to speak, he shed tears acknowledging his younger brother’s presence. Ki Man Kim presented one of his art pieces and expressed his desire to have a joint exhibition with his brother one day. Sadly, that day never came as Ki Chang Kim passed away the following year. But their spirit of brotherhood and longing for unity lives on today. Some of Ki Man Kim’s paintings were recently on display at the 2018 Korean Art Festival at KINTEX (Korea International Exhibition and Convention Center) in Ilsan, South Korea in September and October. 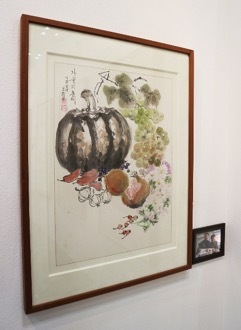 The art festival had a special South and North Peace Art exhibition, featuring rare Chosunhwa paintings. Chosunhwa is North Korea’s most refined art which is traditional ink wash painting on rice paper. Along with the South and North Peace Art exhibit, other displays such as the Republic of Korea Masterpiece Festival, The Grand Art Exhibition of Korea and a foreign artist group exhibition booth, reflected the spirit of reconciliation between the two Koreas. 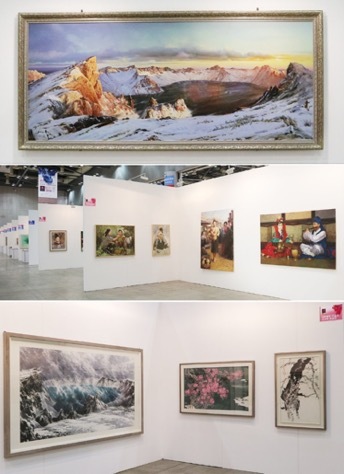 The exhibitions, which included a hundred rare pieces of North Korean art, were possible due to the joint efforts of Bum-hun Lee of the Korea Fine Art Association, KINTEX, Korea Arts Festival Art Fair Organizing Committee, Chosun News Press, Art & People, and the One Korea Global Campaign Organizing Committee with the support of Global Peace Foundation. In addition to the Chosunhwa works, some other North Korean works on display were oil paintings and needle point works of Mount Baekdu, the highest mountain on the Korean peninsula on the border of North Korea and China, and Mount Kumgang located on the eastern coast of North Korea. Some other notable North Korean artists included needlepoint artist Chung-hee Kim and a Chosunhwa painter Chang-mo Jeong. Mr. Kim is the Handicraft Head Manager of Mansudae Art Studio which is likely the largest art production center in the world located in Pyongyang. Mr. Jeong is also one of North Korea’s leading artists. The vision of building a model nation of harmony that upholds human rights and freedoms and advances world peace was already in the hearts of the Korean people in the 1919 March 1 Independence Movement. The One Korea Global Campaign is bringing that vision to the forefront in the consciousness of the Korean people to serve as a moral compass on the path to reunification.